For three years, car mechanic Paen Long stayed up long after his wife went to bed each night, spending countless hours watching videos on YouTube. But these weren't the viral clips or pop music videos that most people while away hours on. 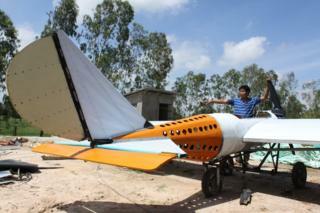 Mr Long, who lives on the side of a highway in Cambodia's rural south-east, had a singular obsession: aeroplanes. "In the beginning, I typed in the word 'jet'," he says. From there, he was led to videos that showed planes taking off and landing, flight simulations, and virtual tours of factories that produce aircraft. One of six children of rice farmers, Mr Long grew up in the years when Cambodia was struggling to recover from the devastation caused by the Khmer Rouge and had never been in an aircraft of any kind. After seeing a helicopter when he was about six years old, he says, the urge to fly preoccupied his mind - for decades. "I always dreamt about aircraft every night. I always wanted to have my own plane," he says. At first, it remained nothing more than a dream. Mr Long dropped out of school early and trained as a mechanic, one of the few non-farming professions available to young men without a high school education in his home province of Svay Rieng. 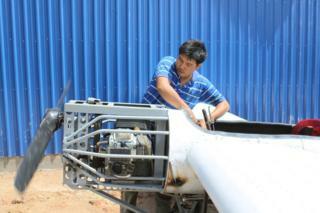 By last year his fascination with flight had taken over and Mr Long, now aged 30 and running his own garage in neighbouring Prey Veng province, decided he had saved enough money to realise his childhood fantasy. "I started building a plane, making it in secret," he says. "I was afraid that people would make fun of me, so sometimes I worked at night." Believing that a helicopter would be more complex to re-create than a plane, Mr Long based his design on a Japanese plane used in WWII. The one-seater aircraft, which has a wing span of 5.5m, took Mr Long almost a year to produce entirely from scratch out of mostly recycled materials. 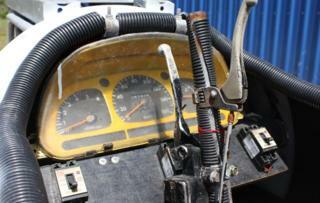 The pilot's seat is a plastic chair with chopped-off legs, the control panel a car dashboard, and the body made from an old gas container. The moment of truth came on 8 March. Just before 15:00, Mr Long started the plane's engine. Three people helped to push it to his "runway": a nearby dirt road leading off the main artery toward rice paddy fields. According to villagers, about 200 to 300 people (Mr Long generously estimates the crowd size to be around 2,000) turned out to watch their first local aviator in action. He strapped on a motorbike helmet - his only safety precaution - and sat inside the cockpit. The plane gained speed as he approached take-off before briefly lifting into the air - Mr Long says he reached a height of 50 metres - and crashing unceremoniously to the ground. The sound of laughter greeted him on his return to Earth. "I was standing there and tears came down [my cheeks]. I felt emotional, because I couldn't bear all the things they were saying to me," he says, blaming the failure on the 500kg weight of his machine. The setback made him more determined than ever to succeed, and he soon turned his attention to a new project. Now, he is building a seaplane - also largely from scrap materials - which he believes he can make light enough to take to the skies. No matter that his village in Prey Chhor commune is located about 200km from the ocean - once it's built, Mr Long plans to transport the new prototype back to Svay Rieng by truck and launch it from the Waiko River. He estimates that the original model cost him more than $10,000 (£7,700) to build and, to date, he has spent $3,000 on the seaplane - no small sum in a country where the minimum wage is $153 a month and 13.5% of the population lives below the poverty line. Not to mention the fact that Mr Long could have treated his entire family to a lavish international holiday for that amount. But, for Mr Long, it's no longer about simply flying. It's about making the impossible, possible. "I never thought about spending money on other things," he says. "I never feel regret about spending all this money." Aside from those who mocked him, many others in the area are in awe of their eccentric neighbour. "I've never met such a person with an idea like this," says Sin Sopheap, a 44-year-old shop vendor. "It's unusual to me," says 29-year-old Man Phary, who runs a roadside restaurant near Mr Long's house, "because among our Cambodian people, no-one [else] would do it." Mr Long's wife, Hing Muoyheng, a 29-year-old car parts seller, says she worries about her husband's safety, particularly as the couple have two young sons, but supports him nonetheless. "I don't know how planes work and he doesn't have any experts to help him," she says of her concerns. "I tried to ask him to stop a few times because I'm afraid, but he said he won't cause any danger, so I have to go along with his idea." Yet although Mr Long hopes to cut the risks to himself and others by performing his July test flight over water, he's acutely aware that his flight of fancy contains a host of variables, many of them outside his control. "Danger," he says, "we cannot predict it." Additional reporting by Ouch Sony.